For the river, see Elvo. For the island mentioned by Herodotus, see Elbo. 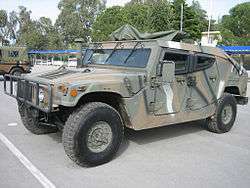 ELVO HMMWV M1114GR (2003), developed for ELVO by Plasan Sasa. ELVO (standing for Elliniki Viomihania Ohimaton, English translation: Hellenic Vehicle Industry), is a Greek vehicle manufacturer based in Thessaloniki. Although it certainly is neither the oldest, nor the most "Greek" in its original technology (it was founded in 1972 after an agreement with Steyr-Daimler-Puch of Austria), it is one that managed to survive the evolutions that basically wiped out the Greek motor industry in the 1980s and 1990s, as it was the only state-owned company in its field. It started business as Steyr Hellas S.A. assembling and manufacturing trucks, motorbikes and farm tractors (Steyr and Puch models). Significant orders for trucks and buses by the Greek Army and state authorities soon gave momentum to the company (some say, at the expense of other manufacturers). The tractor division declined in the 1980s, as the company focused on military vehicles; in 1986 it changed its name to ELVO. The Greek company's first original designs were a 3-tonne truck in 1980 (not industrially produced) and a military bus (chassis and body) in 1981. In the same year it undertook the construction of "its own" Leonidas Armored Personnel Carrier (in fact Steyr’s 4K 7FA model built with minor modifications, again with progressively increasing local content). In 1987 ELVO introduced Leonidas-2, this time with significant modifications of its own. Hundreds were built, while a number of different versions were proposed. In the years that followed, ELVO became a major producer of military and civilian trucks for a variety of uses (all based on Steyr models), engines (Steyr types, many for export to the Austrian company itself), military jeeps (Mercedes-Benz G-Class under licence), customized vehicles and machinery, and buses, with significant exports. Production of buses usually involved body construction on imported chassis; only a few models actually included complete ELVO chassis design and construction, among them the Midas and Europe models of 1993, and a number of military bus types. ELVO-bodied Scania L113 buses exported to Trans-Island Bus Services, Singapore in 1996 were welcomed by that country’s press as the first low-floor buses in the wider region. A number of ambitious plans for company development and new products were not realized, as the state character of the company linked it to effects from government changes and mismanagement. 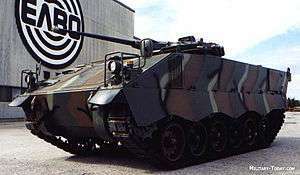 Although it pulled out of a 1988 agreement with Steyr for an Armored Infantry Fighting Vehicle Development, ELVO rather surprised many in 1998, introducing a particularly advanced Armored Infantry Fighting Vehicle of its own design and development, named Kentaurus. 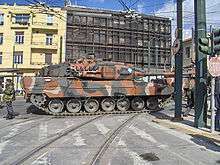 However, the vehicle to this date has not been ordered by the Greek military due to reduced budgets. Another step towards original developments was its initiative for the creation of a light sports car, which was assigned to TWT (an engineering company created in Germany by Greek engineer Dimitris Vartziotis, with facilities in Germany and Greece). The prototype of the ELVO Aletis (meaning "tramp" in Greek), an attractive car designed by Pininfarina with Volkswagen engine, was introduced in the Internationale Automobil-Ausstellung in Frankfurt in 2001, but was never produced. In 2000, ELVO was partly privatised, when the Greek Mytilineos metal and engineering group acquired 43% and undertook the company management. The company faced severe financial problems due to reduced orders in 2009, after production (in cooperation with a number of Greek companies) of 140 Leopard 2 Hel MBTs under licence of Krauss-Maffei Wegmann (KMW), had been completed. It is understood that the management of the company reverted to the Greek state in 2010. 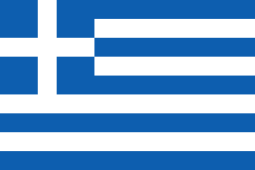 The Greek state petitioned to put ELVO into receivership in January 2014. The plan under the receivership proposal was to split ELVO in two with a bad company carrying debts and obligations and a good company that it was hoped would be attractive to an external partner. By 2015, the company was in the process of being dissolved. However, in April 2015 the dissolution had been frozen as the Greek government sought to find a private buyer for the company, citing its strategic importance to the Greek defence industrial base. 1 2 3 4 "ELBO Hellenic Vehicle Industry SA". IHS Jane's. 2015-04-08. Retrieved 2015-08-28. L.S. Skartsis, "Greek Vehicle & Machine Manufacturers 1800 to present: A Pictorial History", Marathon (2012) ISBN 978-960-93-4452-4 (eBook). Jane’s Military Vehicles & Logistics, 2003-2005 editions. Jane’s Armour & Artillery, 2005 edition. Simon Dunstan, 'Modern Tanks & AFV's' (Vital Guide), Airlife Publishing (2002). Wikimedia Commons has media related to ELBO vehicles.